Provide comfort for the family of Michelle Gilet with a meaningful gesture of sympathy. 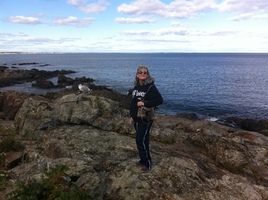 Michelle Gilet, age 47, a resident for the last 12 years of Lunenburg with her beloved significant other Kenneth Clair, passed away peacefully on April 5, 2019 at Lahey Hospital and Medical Center, Burlington. She was born in Woburn on June 21, 1971, and is the daughter of Bernadette (Queen) Gilet and the late Richard J. Gilet who passed away in 1996. Michelle was a graduate of Chelmsford High School Class of 1989. She has been an animal lover all of her life. In her early years, she was an avid soccer player. In her spare time she enjoyed spending time with her family, especially her beloved nephews Zachary and Travis Ricardo. Michelle had a zest for life that will be greatly missed. In addition to her mother of Chelmsford and Kenneth, Michelle leaves her sister Patrice Gilet and her significant other Kevin Chiavelli of Chelmsford, her nephews; Zachary Ricardo and his girlfriend Kristin Marquette, Travis Ricardo and his girlfriend Brooke Blaisdell and Kevin's daughter Laura Chiavelli. Michelle also leaves many other family and friends near and far. Visiting Hours will be held from 4:00 - 7:00 pm on Wednesday in the Blake Chelmsford Funeral Home, 24 Worthen St., Chelmsford. A Mass of Christian Burial will be celebrated on Thursday at 11:30 am at St. Charles Borromeo Parish, 280 Main St., WOBURN. In lieu of flowers, expressions of sympathy may be made in Michelle's memory to the Lowell Humane Society, 951 Broadway St., Lowell, MA 01854 or www.lowellhumanesociety.org. To plant a memorial tree in honor of Michelle Gilet, please visit our Heartfelt Sympathies Store. I was lucky to call her my friend. Gone but not to be forgotten.